Prior to 1950 the Manufacture d’Armes de Bayonne (MAB) had produced only guns intended for self-defense, all on a very similar pattern, primarily based on Browning’s 1903, 1906, and 1910 designs as manufactured by Fabrique Nationale and/or Colt’s. But, whether due to a change in ownership or simple economic necessity, after this time the company began to produce several new guns intended for target shooting and military use. 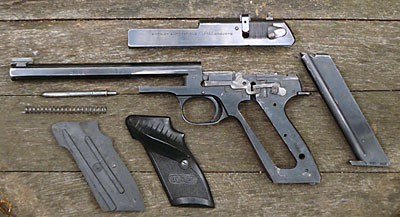 The Model F was the company’s first target pistol. Production began on 26 April 1950. A passing resemblance to the Colt Woodsman has been noted by Josserand, but the resemblance is primarily external and almost certainly due to the Woodsman’s iconic status. Both guns have internal hammers, but little else is the same. I see a greater resemblance to the Star Model F of 1928 which, though it has an external hammer, is like the MAB Model F in that it has a flat-sided barrel, an open-top slide, and the recoil spring beneath the barrel. The open-top slide design originated with the 1900 Steyr-Mannlicher, and was perpetuated by Star, Walther, and Beretta, among others. 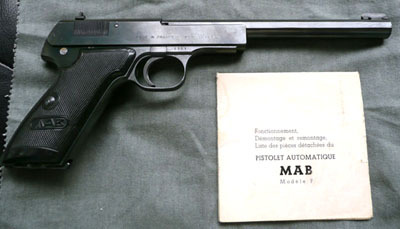 MAB’s Model B, which was based on the Walther Model 9, also had an open-top barrel design, as noted by Hogg & Walter. The MAB Model F is an unlocked breech self-loading pistol chambered for the .22 Long Rifle cartridge. The lockwork is mounted on the left side of the frame and is covered by the slide and left grip panel. The Model F features a top-mounted connector or transfer bar which is pulled forward to trip the sear. A lobe of metal extending up from the transfer bar serves as a disconnector--when the slide moves to the rear the lobe and transfer bar are pressed down and out of engagement with the sear. A simple but effective magazine safety consists of a spring-loaded lever on the left side of the frame which moves down to block the front of the sear when the magazine is removed. The manual safety is a rotating lever which, when engaged, locks the hammer back, disengaging it from the sear. The manual safety lever, when engaged, can also be used to lock the slide back when the slide is pulled all the way to the rear. The recoil spring guide rod has a small spring-loaded plunger set into its rear--this plunger tensions the trigger when the hammer is not cocked. The Model F does not have a rebounding or inertial firing pin. The extractor is internal, mounted on the right side of the slide. There are two types of the Model F and several subvariants. The earliest Type I Model F pistol is distinguished by its round barrel and lack of a locking lever on the left rear of the slide. Serial number 1 recently surfaced in California. It was originally owned by Cecil Jackson of the Western Arms Corporation, and should probably be considered a prototype as it has some features that may be unique or shared only by other very early examples. It has unmarked grips and lacks a takedown latch. Early specimens, into the 600 serial number range, have a small ramp front sight dovetailed into the barrel. Starting at least by serial number 600, there is a screw on the back of the grip tang, off-center to the left side, which retains the spring and plunger that tension the manual safety lever. Starting at least by serial number 1500 the round barrel is replaced by one with flat sides. As best I can tell, not many more than 2500 of the Type I Model F’s were made, and I have probably not documented all the variations. (If you have an early gun, please email me with any additional information you can provide.) I do know that the early guns have a square-cut cover on the right side of the frame where the trigger is installed. This cover has a hole in it for easy removal. The square-cut cover was present at least through serial number 1644, and was replaced by serial number 2301 with a half-round cover, with no hole, that was probably easier to machine. This change would probably have taken place sometime in 1953. The front sight on most Model F’s is, according to my friend Nick Stroebel, a Redfield Sourdough sight dovetailed into the barrel. This was a common target sight for rifles in the 1950s. It looks a bit over-large on a pistol. The manual which was included with serial number 2301 shows the Redfield Sourdough sight. 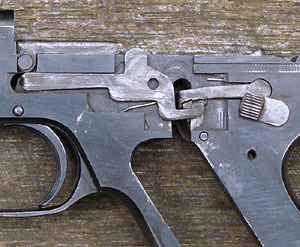 The distinguishing feature of the MAB Type II Model F is a lever on the left rear of the slide, just above the manual safety, which serves to lock the slide--and hence the breech. The lever rotates a wedge of steel down into a v-shaped cut in the back of the frame. This enables the breech to be sealed when a round is fired, giving maximum velocity. It also enables the gun to be very effectively suppressed. Not only will little sound escape from the breech, but there will be no sound of the action working, and no cartridge ejected. By serial number 4149 the screw at the back of the grip tang was eliminated, enabling the grip tang to be extended by making a cut at the rear of the frame and pinning a separate “tail” onto the gun. The hole for the safety spring and plunger was drilled from the top, down to below the level of the safety--the spring is inserted first, then the plunger, then the safety is installed from the side, the tension from the spring and plunger retaining the safety, and the safety preventing them from escaping. This is by far the most common configuration of the Model F. I have thus far documented two specimens without the screw that do not have the “tail,” (please write if you have one). The Model F was available in a number of different barrel lengths, from just over 2-1/2 inches to just over 7 inches. Most of the ones I have seen have had a rather long barrel, but Model Fs are so scarce I haven’t observed that many. The barrel on my gun is 173 millimeters long. MADE IN FRANCE FOR W.A.C. The last two digits of the serial number are stamped on the underside of the slide, and the breech block and slide lock have assembly numbers stamped on them. But there are no proof marks of any kind on the gun. The early Type II shown here is serial number 4532. We have observed serial numbers for Type II Model Fs as low as 3678 and as high as 117XX (the owner didn’t wish to reveal the entire number). The slide can be locked open by rotating the manual safety lever all the way to the rear and drawing the slide back, but the gun should be properly field stripped so the barrel can be cleaned from the rear. The gun probably originally came with a tool to operate the take-down latch, but I didn’t get one with my used gun. It requires a tool with a rounded point, about a millimeter in diameter, or perhaps a tad smaller, and 3.5 to 4 millimeters long. You may be able to use a paper clip or a slim drift punch. Insert the tool in the hole in the latch on the left side of the slide and move the latch upward. Pull the slide to the rear and lift it up out of the frame rail. The trigger on the Model F is not nearly as good as a target trigger should be. It is a little rough and the let-off is not crisp. It might be possible to polish some of the lockwork parts, but I’m loath to take the gun apart sufficiently to try it. I found that at 10 yards (about as far as I can see well enough to shoot with open sights) I could occasionally shoot 1.25 inch groups (gun grip resting on bench, but no barrel rest). Several times I got a cluster of shots about 3/4 inch across, but it would always be marred by flyers. I’ll try again later with a sandbag to rest the barrel on. I ran muzzle velocity tests with the breech locked and unlocked, using two different kinds of ammunition. The result was an average 8% to 9% increase in muzzle velocity with the locked breech. With the seven-inch barrel, Winchester Xpert High Velocity ammo with 36 grain hollow point bullets had an average muzzle velocity of 1248 ft/sec with the breech unlocked; with the breech locked the same ammo averaged 1350 ft/sec. John-Paul Attwood, who owns the silenced Model F shown above, says that the gun is significantly quieter with the breech locked. I found that with the breech locked, the gun shot consistently about an inch-and-one-half lower at ten yards. * I would like to hear from anyone who has a Model F. I’m particularly interested in collecting serial numbers and knowing whether your gun is a Type I or a Type II. There may be more types than I know, so if your gun differs in any way, please send photographs. and special thanks to Bill Kelsey for sharing information and expertise. Click most photographs to open a larger version in a new window & browse for additional photographs.